As 2016 draws to a close and 2017 leaps upon us it's great to take a minute and look back on all that the Bomber Crew has accomplished in just a years time. 2016 was a great year as Bombers CrossFit has continued to grow well beyond my humble expectations. Over the past year we had the privilege of meeting almost 70 new members, while having the difficult time of saying good-bye to many of our military friends and international students returning home. I can now proudly say there are members of the Bomber Crew representing the Bomber Nation all over the world from overseas deployments to international students moving back home. I've loved seeing pictures tagged all over the globe by the Bomber Crew and it seems each year our community reaches farther and farther. I'll try to highlight some of the amazing things you all have accomplished in 2016. We kicked off the year with a Running Clinic. On a beautiful January weekend Coach Dan drilled many of you on the finer points of running for performance and efficiency. January also saw what was a trend for the year, our monthly attendance skyrocketed. Each month surpassed the previous, destroying any projections, predictions, or my wildest ideas. Then in February the Bombers Barbell Club hosted its 1st In-House Weightlifting Meet. With the tremendous support from Coach Lillie & Jason so many of you had the chance to taste Olympic Weightlifting competition on the small stage. The BBC Meet planted the lifting and competition bug into many of the crew. Spurring you all on to many PRs and taking your training to the next level. As the competitive spirit flourished, the CrossFit Games Open began. In late February and through March we had so much fun competing against ourselves and the rest of the world in the Open. The Friday Night Throwdowns each week were amazing -- from the athletes pushing the limits, to the support of the Bomber Crew, and especially the food and fellowship afterwards. Your Bomber Coaches hosted a Nutrition Seminar in April. Coach Adam and Coach Mona spent the majority of a Saturday explaining the finer points of nutrition. They dove into the Zone and Paleo diets, explaining how to optimize your nutrition for athletic performance. Their expertise gave many real life examples of how to make small lifestyle changes to move towards healthier eating, and improving your overall fitness. Soon there after, Coach Dan showcased his military and law enforcement background holding weekly Self Defense classes. For an hour each week Dan instructed the Bomber Crew how to defend themselves in many different situations. He demonstrated various techniques from many different self defense disciplines -- mainly instructing in the principles of Krav Maga. Dan helped instill confidence in any situation for many members of the Bomber Crew. Then in May we expanded our class schedule, adding 5am and 4:30pm Monday through Friday. These classes were immediately popular, filling up quickly. The added classes were a result of bringing on and training new coaches to the Bomber Staff. Coaches Mona, Megan, Amy, and Justin joined the Team and have been pushing the Crew to reach their goals. Also in May Bombers CrossFit hosted two major events, Team RWB's 21 Guns Salute and the Memorial Day Murph. Both events had large turnouts and had tremendous support. The Team RWB 21 Guns Salute is a tribute to veterans held twice a year. Bombers CrossFit was one of thousands of gyms around the country to host the event honoring those who've served our country. Then a week later the Bomber Crew celebrated Memorial Day in the only way CrossFitters know how, with the "Murph". Again the gym was packed and the Bomber Crew had the privilege of honoring those who've paid the ultimate price for our country. Then as the coolness of Spring faded into the heat of Summer, contest season came into full swing. The Bomber Crew sent a large contingent up to Columbus to volunteer at the CrossFit Games Central Regional. We had members judge, work security, set-up equipment, and many go up and watch the action. One of the highlights leading up to the Central Regional was our very own Erik Grant competing in the Masters Qualifier. Erik did an outstanding job, showcasing his superior level of fitness finishing 53rd in the world, and just missing the cutoff for the CrossFit Games! There were many other local competitions the Bomber Crew threw-down in, including The Route 33 BarBelle Throwdown, Self-Starter Invitational, DSC's WOD about a 5K, Guns & Ribbons Throwdown, The Tough Mudder, Project Lift Weightlifting Competition, and the Granite Games Qualifier, just to name a few. As the year continued to march forward, in October we unveiled the Bombers Testing Week, 6 WODs designed and named after America's bomber aircraft. These tests pushed us hard both mentally and physically. We re-tested the Bomber Week in November and saw outstanding results. Also in October, we finalized the purchase of 5+ acres of land which is slated for the new home of Bombers CrossFit. Then on into November, the Bomber Crew kept competing and pushing themselves all over the Dayton area. You all competed in the Garage Games, the Masters Tour, and the Veterans Day Throwdown. 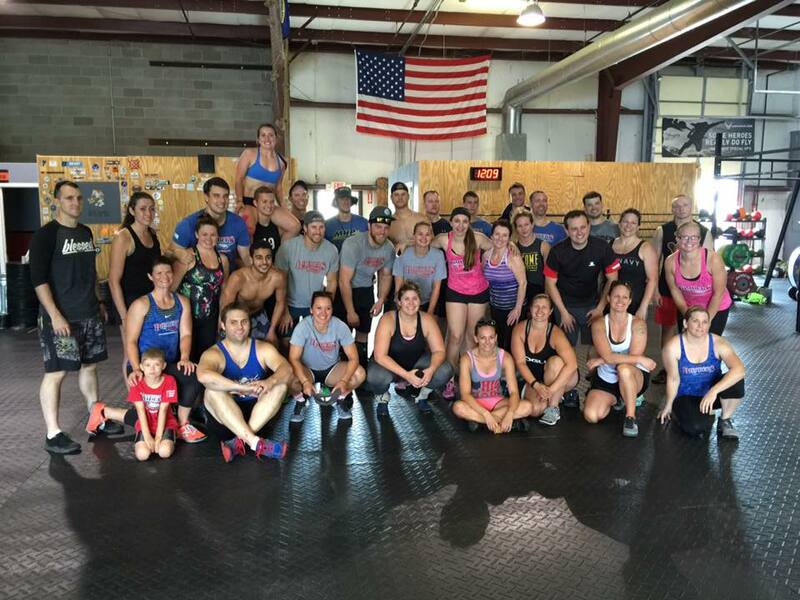 On Veterans Day Bombers CrossFit again had the privilege to host Team RWB for a WOD. You all were able to celebrate and honor the lives of the so many veterans that live, work, and WOD with us. As we wrap up 2016 and holiday travels took many of the Bomber Crew out of state and out of the country, many of you continued to push your limits. Bombers CrossFit is also pushing its limits, we are soon to annex some extra square footage for the next year. This extra space will come with the addition of lifting platforms and a separate area for the BBC. We've also began to meet with the designers and architect for the future building project. There is so much in store for 2017! I cannot wait to see what we can accomplish together.